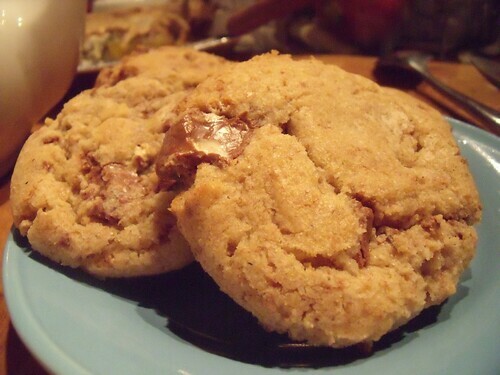 Can I interest you in the best cookie I’ve ever made, ever? 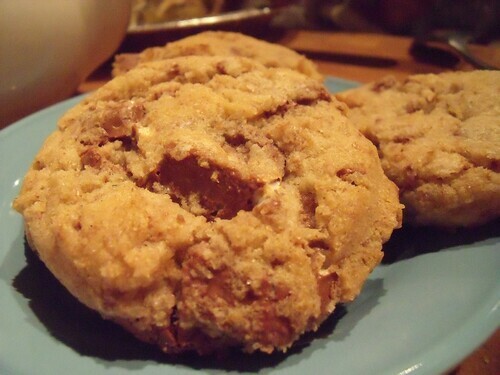 They’re 100% whole wheat, and buttery, and made with chunks of Toblerone instead of chocolate chips. Ohhhhh yes, they are amazing! My Dad declared them the best cookies he’s ever had, and everyone was surprised to discover they were whole wheat. They came to be after my fabulous foodie friend Lisa posted on facebook that she’d made “Toblerone Chip Cookies” for a party the boyfriend and I couldn’t get to because I was performing that night. So when I made dinner for the boyfriend and I the next night, we definitely needed to try these out. I took my regular, “house” chocolate chip cookie recipe from the amazing Kim Boyce, and just subbed in the same weight of chopped Toblerone pieces for the chocolate chips. Easy peasy and best cookies ever. Seriously, you’ve got to give these a go. I’d also love to try these with other favourite chocolate bars! What amazing combinations can we create? Ohhh! I have to tell you about my new-to-me discovery! 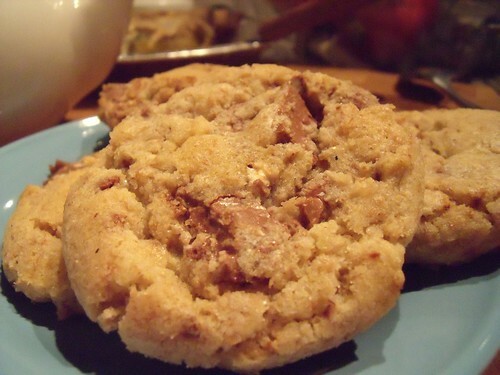 If you scoop out the dough into balls with an ice cream scoop, pop them on a cookie sheet, then refrigerate the batter for 30 minutes, you get nicer cookies. I’m going to be doing this all the time. 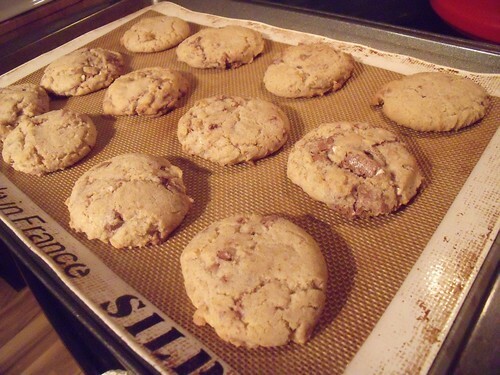 Adapted from the fabulous Good to the Grain: Baking with Whole-Grain Flours, makes about 48 cookies. In a stand mixer with the paddle attachment, combine butter and sugars on low until just combined. Add the eggs, one at a time until incorporated and add vanilla. Add flour mixture, and continue on low speed until just mixed, about 30 seconds. 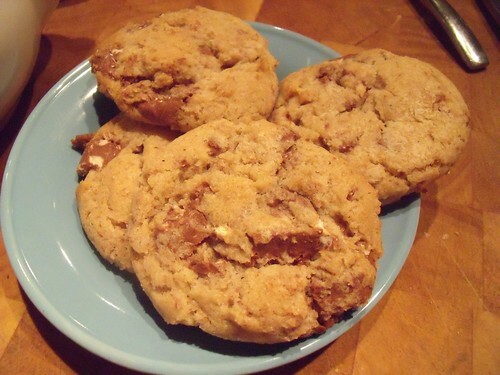 Add Toblerone chunks and mix until they are evenly distributed throughout the dough. Using an ice cream scoop, scoop balls of dough (about 1-2 Tbsp. in size) onto the prepared baking sheets. Pop the baking sheets into the fridge for 30 minutes. Bake for 8 minutes, rotate the baking sheets, and bake for another 8 minutes. Either repeat with the remaining dough, or roll into plastic-wrapped logs and freeze for later, keeping in mind that the cookies are best eaten warm, straight out of the oven. Marvel at your delicious creations and share them with people you love! Can you tell me about the baking pad you use with the baking sheet? Is it reuseable? The reusable baking pad is a silicone mat called a Silpat . I adore mine and have been using it for about 5 years!! I use it in place of parchment or aluminum. The only thing it doesn’t work so well for is dehydrating apples or veggies to make chips… they don’t dry out on the Silpat. looks fantastic! Lindsay, what does the 30 minutes pre-baking refrigeration do exactly? I found that when I baked the dough from sliced logs right out of the freezer the cookies did a better job of holding their shape. When I baked from freshly-made dough they sometimes blobbed into flat things that spread over the baking sheet and made one giant cookie, OR they were perfectly in shape, and I couldn’t control which happened… I think it’s a temperature-in-my-apartment problem, so thought I’d try refrigerating the dough (like you did with the freezer dough). Voila – they stayed in lovely cookie shapes with lovely mounded tops, and tasted great! I really wanted chocolate chip cookies but I did not have any chocolate chips but I did have a couple bars of toblerone. I made this recipe and it came out AMAZING. I deeply recommend it. AWESOME! I am so glad you loved it, thanks for sharing your experience!! !